Northcity4 is a sustainability focused artist run initiative, bringing together jewellers with those keen to learn jewellery skills and to know more about the field. Based in Brunswick, just north of Melbourne’s CBD, Northcity4 runs regular courses in jewellery making, workshops, lectures and seminars. In October, they’re hosting ‘Jewellery 3 Ways’, the first of an annual series of events that invites three artists from various disciplines to discuss their work. 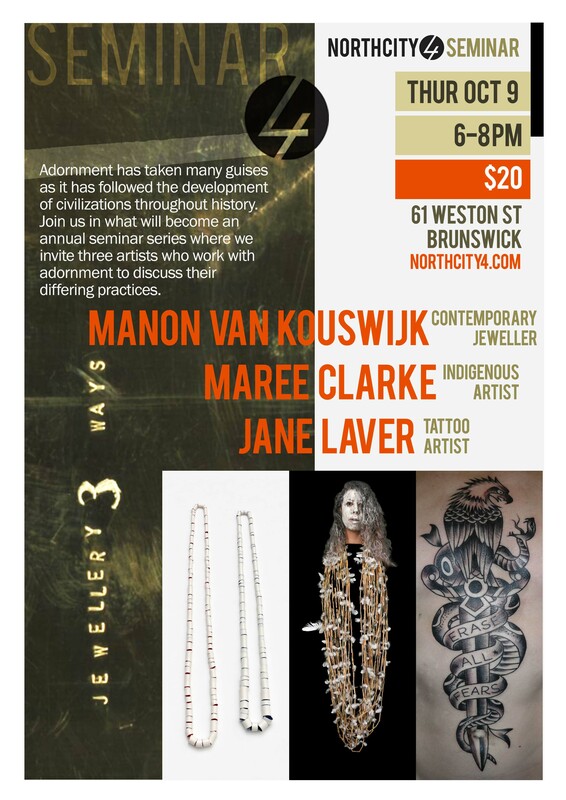 Featuring Gallery Funaki’s Manon van Kouswijk, as well as indigenous artist Maree Clarke and tattoo artist Jane Laver, the evening will be a fascinating look across discplines at the broader nature of adornment. Gallery Funaki will be there with books and catalogues available for sale.